Ben Laurie, project lead for Google’s Certificate Transparency (CT), recently published an article wherein he compared CT against various efforts to secure Internet communication world-wide from Man-In-The-Middle Attacks (MITM), including DNSChain. It does not help the slightest that Google continues to make these—in our opinion, inaccurate—claims about CT in its official documentation (and elsewhere), in spite of being informed about their inaccuracies. And yet, decisions that impact the security of the entire Internet are being made based on these statements. We (the Internet community) need more eyeballs and brains on this. The diagram below shows how many MITM attacks circumvent HTTPS today. This is explained in more detail in the video linked to above. Currently, CT does not attempt to prevent these attacks from happening. Instead, it attempts to make these attacks easier to detect after they’ve successfully happened, but as we’ll see, it doesn’t even guarantee that. At its core, it introduces the concept of an append-only auditable log that is guaranteed to show the most recently issued SSL cert for any given domain (IF you’re able to ask it). EDIT September 27, 2014: Actually, that is not true. Auditors are not shown the most recent cert for any arbitrary domain. Verifying that no fraudulent certificates have been issued by a rogue CA is the responsibility of Monitors, who continuously poll logs and download their contents. Websites that want to run HTTPS purchase (annually) an SSL certificate from a Certificate Authorities (CAs). In CT, the CA takes the additional step of informing log(s) about this new certificate. The website owner can independently check the logs to confirm his certificate is there. His server will then attempt to send this certificate to all visitors. The problem, however, is that not everyone will see this certificate. If you’re able to, take a moment to go read Google’s documentation on how CT is supposed to work. Pay close attention to the four figures that they currently have there (except the one on OCSP stapling; it’s not relevant to the overall security of the system). Here’s a copy of that page. When you’re done, return here. Let’s dive into the claims Google is making. The logs do not themselves detect misissued certificates; they rely instead on interested parties, such as domain owners, to monitor them and take corrective action when a misissue is detected. OK, but what about that undetected MITM attack I’ve been alluding to? The SCT (signed certificate timestamp) is pretty much irrelevant in this type of attack since the MITM either can order CA/log combos to do what they want, or they own and operate one of the 1200+ CAs out there (in a clandestine operation), or they’ve hacked their way into obtaining the CA/log private keys they need to conduct mass-surveillance on any website they want (undetected). Fraudulent SCTs and SSL certs are generated for target websites and bundled together, sent to victims. Edit September 27, 2014: I’m not sure how no one brought this up until recently, but the attack can be much simpler. None of CT’s proofs (audit or consistency proofs) will detect mis-issuance of a certificate by a rogue CA, not even if gossip of STHs (signed-tree-heads) successfully occurs. On the other hand, if CT switches to using SCTs for gossip, that might successfully catch the CA responsible if the MITM leaves and if the server software keeps track of all the certs it issued. It will not help, however, if a revoked certificate was used for MITM. Edit September 28, 2014: The number of CAs out there is disputed, and not all CAs will necessarily have their own log. It’s been known since at least 2011 that blockchains like Namecoin can do this in a very clean manner, and be done “effectively” using software like DNSChain (mentioned in all but name in 2011). There is what’s known as a Sybil attack that can prevent blockchain nodes from seeing updates, but this is very hard to exploit and can be detected (see the mitigations in that link). Such an attack would require a MITM to first compromise a *specific* server’s private keys, and therefore limits the scope of the attack to that server only (whereas in CT, a CA compromise results in MITM for any website on the Internet). Everyone can participate. It is not hard to get a certificate into a log, and since the log itself makes no judgment on the correctness of the certificate, there’s no change to the revocation of bad certificates, which is still done by the CAs. 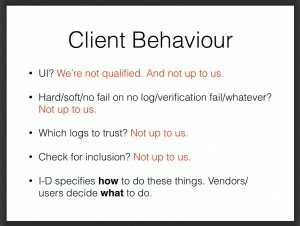 Finally, a fourth tradeoff: what should be admitted into a log? An attractive response is “anything,” but logs are useful only if their size is manageable. Someone has to watch them, and if they become so large that no one can feasibly do this, then the logs may as well not exist. The straightforward answer is to admit only those certificates that can be chained to a CA that the clients recognize. There’s arguably no point in logging certificates that do not satisfy this criterion, since browsers will not accept them anyway. Note that being a CA and running a log is a game that only a few can play. These services are run by an elite group which charges an annual subscription fee for the facade of security (CA-signed HTTPS certificates). DNSChain & Namecoin, on the other hand, actually don’t discriminate, and they support 100% free self-signed certificates that are actually MITM-proof. No trusted third party is introduced. Although the log is indeed a third party, it is not trusted; anyone can check its correct operation and, if it misbehaves, prove that it did. Saying a thing does not make it true. As explained in detail above, these logs are being trusted. Those who monitor logs for misbehavior will not see all certificates that have been issued. The reality is that webmasters can be shown “proofs” that mean absolutely nothing. If the webmaster trusts that proof, then he’s trusting the log is not hiding any merkle trees used for the purpose of MITMing users. There is nothing preventing a rouge CA/log combo (Google itself expects “every major CA” to be a log) from receiving a National Security Letter (NSL) and start MITMing SSL connections with fraudulent SSL certificates that have fraudulent merkle inclusion proofs corresponding to trees that are not shown to anyone else. The same is true of a CA/log combo that, unbeknownst to the Internet community, is covertly owned and operated by the Five Eyes. With so many trusted third-parties involved, government spooks aren’t the only ones capable of pulling off these attacks. A group of hackers needs two things to conduct undetected mass-surveillance on millions of netizens: (1) the private keys of one of the 1200+ CAs out there, and (2) access to a “privileged network position” (which can be obtained by hacking into a variety of Internet choke points, such as ISPs). Finally, Certificate Transparency does not push the decision onto the user. The certificate is either logged or it is not. If it is logged, then the corresponding server operator (or other interested parties) can see it and take appropriate action if it is not valid. If it is not logged, then the browser simply declines to make the connection. 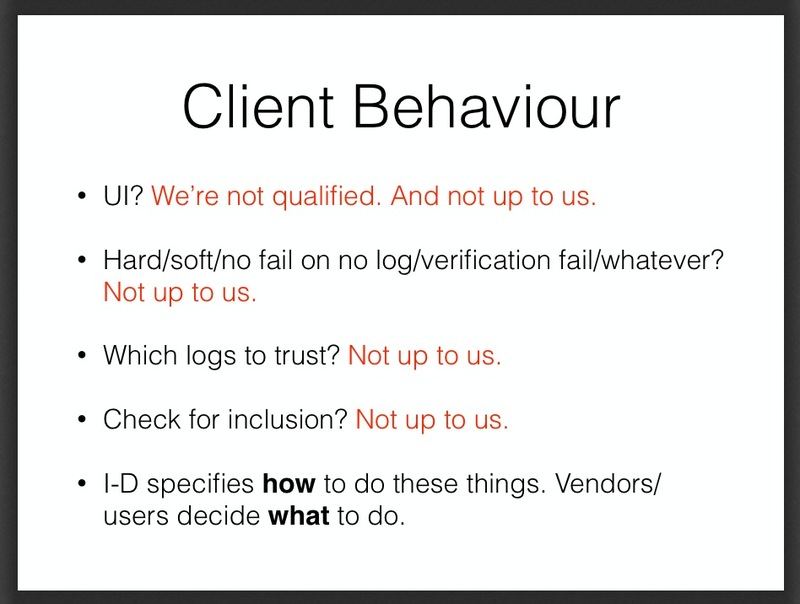 “Server operators” need to constantly monitor these logs and make a decision—“appropriate action”—if they see something wrong. CT doesn’t even offer much advice here. Users around the world are supposed to call or email tech support to companies whose languages they don’t even speak? For more, do a case-sensitive search for the words “RECOMMENDED”, “MAY”, and “OPTIONAL” in RFC 6962. Bizarrely, Laurie lists five constraints that solutions should adhere to but does not examine whether the alternatives fit them: (1) possible for Internet to migrate to, (2) scalable & and makes participation possible for everyone, (3) fast, (4) doesn’t make things worse, and (5) doesn’t force end-users to make decisions. I have written extensively on what is wrong with Bitcoin (for example, it is the least green invention ever, and all of its history could be destroyed by a sufficiently powerful adversary if it were truly decentralized, which it is not). Nevertheless, people continue to worship irrationally at the altar of Bitcoin, and this worship extends to DNS and keys—for example, DNSChain (https://github.com/okTurtles/dnschain). Apart from being an extremely costly solution (in terms of wasted energy, in perpetuity), it also introduces new trusted third parties (those who establish the “consensus” in the block chain) and has no mechanism for verification. OK, so let’s address that. First off, some blockchains employ consensus algorithms that do not require computation to secure the network. Two of the three existing forks of DNSChain are based on such systems (BitShares DNS and NxtCoin). The very concept of “wasted energy” is based on the idea that we have a scarcity of it, which we do not. We have an inexhaustible daily supply of it shining down on us every day, more than enough to power the entire world several hundred times over. It is not the blockchain’s fault if humans choose to not use it. Those responsible for “wasting energy” are those who choose to rely on energy sources that can be wasted. Once we stop, you can take month-long steaming showers without any “wasted energy”. Proof-of-Work can be used to perform calculations that benefit society. EDIT March 21, 2015: Even Bitcoin’s standard Proof-of-Work consensus mechanism (PoW) does not waste energy. To waste energy is to use it inappropriately or for no purpose. However, PoW uses that energy for a very valuable purpose: securing the blockchain. The result is a decentralized database that has a level of combined security and utility that is literally unprecedented in Internet history. Therefore, DNSChain is not responsible for any “wasted energy”. This is true, but unlike the thousands of untrustworthy third-parties of CT, users actually have legitimate reason to trust the third party: they know the third party personally and already trust them. The DNSChain server they trust either belongs to them, someone they personally know and trust to operate it, or they can query multiple independent servers and verify the responses match. This is simply not true. DNSChain is the “mechanism for verification”. In order to be MITM-proof, its public key fingerprint needs to be verified only once, after which, all other Internet connections (that have their info in a blockchain) become MITM-proof without need for any further verification. There are legitimate issues with blockchains, most notably 51% attacks. On 51% attacks, a lot of interesting research is currently being done, but *any* distributed and decentralized system will face consensus problems when the majority of participants are malicious. CT, however, makes this problem worse by reducing the number of malicious actors required by orders of magnitude. Does DNSChain satisfy Laurie’s five criteria? Possible for Internet to migrate to: Yes. The design is much simpler than CT and X.509. The only challenge is wide deployment, but this is possible. Most families run Linux servers at home without realizing they do, and there’s not much preventing DNSChain from running on that server. Alternatively, it might even be possible to combine/replace with full-security thin clients running in browsers/OSes (see “Ultimate blockchain compression UTXO”, which incidentally employs Merkle trees!). Scalable & and makes participation possible for everyone: Yes, as elaborated above, blockchains are far more democratic than today’s CA system (and any updates to it, like CT). Successfully decentralized and distributed systems like the blockchain have demonstrably achieved fantastic scalability to date, and that will only improve. Fast: Yes. No need to query across the internet to some centralized service to authenticate SSL certs. Just ask your home router. Doesn’t force end-users to make decisions: DNSChain excels at this. No more uncertain hand wringing “proceed with caution” / “make an exception?” SSL warnings. Either the connection is secure or not. The one decision they must currently make (a one-time verification of their DNSChain IP and fingerprint) can be automated in the future to a large extent. Thank you for reading, and special thanks to Zaki Manian, Simon de la Rouviere, Filipe Beato, and one anon. for reviewing this post prior to publication! Overall, very good points. But I question the validity of point #2 under “wasted energy”. While it is technically true that solar power (with or without the use of other renewable energy sources) is capable of exceeding global power needs many times over, it is not currently technologically nor economically feasible to implement such a large-scale conversion from finite power resources to full use of solar power on any near-term timetable. It is expected and probable that such a conversion will become feasible in the future, perhaps even before the midpoint of the century, but it is not so now and there is no consensus on how soon that point will be reached (in part because it is heavily dependent upon highly variable political factors, not just scientific and technical ones). It is a detriment, not an asset, to your overall argument to use the hope of future technological adoption as a counter to a current criticism. The reality is that currently, the vast majority of energy production worldwide comes from finite resources, and so waste of energy is a valid concern. Your argument would be stronger if you focused on how DNSChain is not wasteful of energy and avoided editorializing on the matter of humanity’s failure to embrace solar power (which really isn’t particularly relevant to the larger issue here of Internet security, or the narrower issue of the relative merits of CT vs. DNSChain). Point well taken Mark, thank you for reading and leaving your feedback! I do still feel inclined to mention it though, partly because I feel it is part of a relevant and complete defense, and partly because the reality is that we (humanity) are currently/presently responsible for choosing where we get our energy from. Incidentally, I consider Daniel Nocera’s concept of “personalized energy” (linked to in the post) to be fairly analogous to Satoshi Nakamoto’s concept of the blockchain. Both are methods of decentralizing and distributing a resource that was previously controlled by a central authority. 3 corrections/updates were made to this document, search for “Edit September” to see them. I updated my comparison of Certificate Authority system proposals to include DNSChain https://www.scriptjunkie.us/2013/12/a-comparison-of-https-reforms/ Let me know if you think DNSChain is unfairly represented. I think you would find greater interest if there was a basic how does DNSChain work somewhere. I see https://github.com/okTurtles/dnschain#metaTLD which mentions lots of benefits, etc., but it seems to be missing the paragraph of “somebody who wants to get a domain does X and sets up their server… to access a server, DNSChain does Y…” It appears all the content of the “how do I use it” section is only accessible if I actually change my nameserver to one of yours and then visit the links there. That’s kind of extreme. I’d like to see how it works before I reconfigure my system. Pingback: SSL Review: September 2014 - Entrust, Inc.
Proof-of-Work is not “wasted energy”, period. That energy is being used for an extremely valuable purpose: securing the blockchain. The result is a level of security and value that is so far unprecedented in human history.